Physical characteristics: Common trumpeters are 18 to 20 inches (42 to 52 centimeters) in length and 2 to 3 pounds (1 to 1.5 kilograms) in weight. They are dark in color with a patch of light gray on the back. They have long legs and a long neck. Young common trumpeters are dark gray with reddish stripes. Geographic range: Common trumpeters are found in northwestern Brazil as well as portions of Colombia, Ecuador, Peru, Venezuela, and the Guianas. Habitat: Common trumpeters are found in dense areas of tropical rainforest. Diet: Common trumpeters eat fruit, mostly that which has been knocked to the ground by monkeys. They also eat some insects, particularly beetles, ants, and termites. Behavior and reproduction: The common trumpeter is generally found in groups of three to twelve individuals. A single dominant female mates with as many as three dominant males. 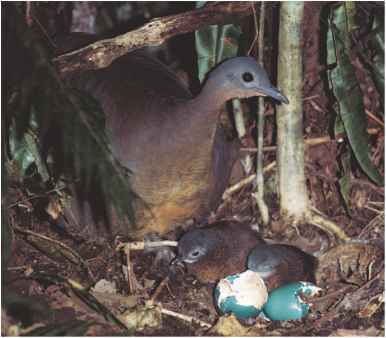 Three eggs are laid at a time, usually in a hole in a tree. Eggs hatch after approximately twenty-eight days. All adults in the group help in feeding and caring for the offspring. Common trumpeters and people: Common trumpeters are sometimes hunted for food. "Family Psophiidae (Trumpeters)." Animal Diversity Web. http:// animaldiversity.ummz.umich.edu/site/accounts/classification/ Psophiidae.html#Psophiidae (accessed on April 28, 2004). "Psophiidae (Trumpeters)." The Internet Bird Collection. http://www.hbw. com/ibc/phtml/familia.phtml?idFamilia=45 (accessed on April 28, 2004). "Trumpeters." Bird Families of the World, Cornell University. http:// www.es.cornell.edu/winkler/botw/psophiidae.html (accessed on April 28, 2004).